After recently completing their massive summer co-headliner with The Black Dahlia Murder, Whitechapel will head out on the road again this November/December, to embark on their “Ten Years of Exile” USA tour, commemorating the 10th anniversary of This Is Exile. 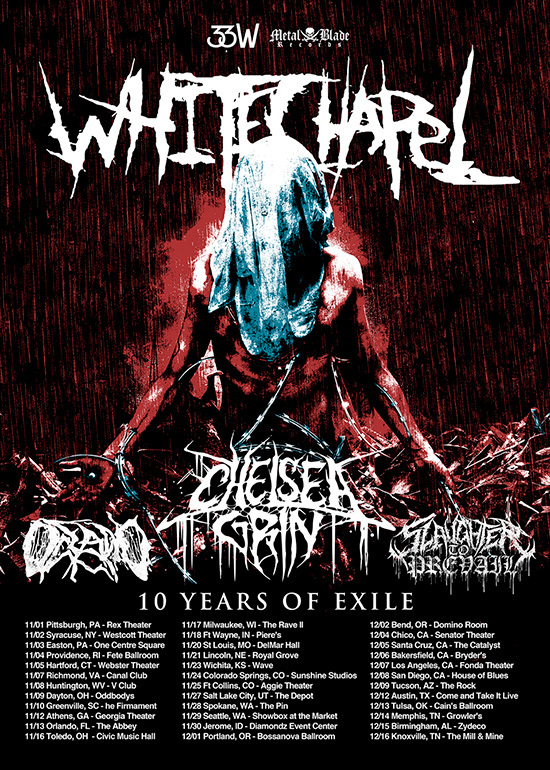 Featuring Chelsea Grin, Oceano, and Slaughter To Prevail as support, this trek will also see Whitechapel perform This Is Exile in its entirety, plus a selection of other songs – and will be the last run of shows before the band returns to the studio to finish recording their upcoming album, due out spring 2019 via Metal Blade Records. See below for all dates!